"Jumping Jehoshaphat Batman, we almost hit that seagull!!" 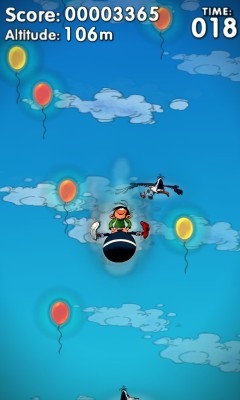 All kidding aside, this first Gaston episode (#2's already availanble for the iPhone) has our intrepid hero taking off into the clouds in search of baloons and seagulls. Angry Birds it ain't but for $2.99 I could think of worse ways to pass the time. If you're interested, hit the link to get it from Windows Marketplace (no trial unfortunately).